Here’s a wealth of information about FALL-PLANTED DIVERSE BULBS from our email Gazette and past catalogs, starting with the most recently published. For other topics, please see our main Newsletter Archives page. “The ‘Magnet’ snowdrops that I planted last fall have been in bloom for about three weeks, and they are the biggest snowdrops that I have ever seen. 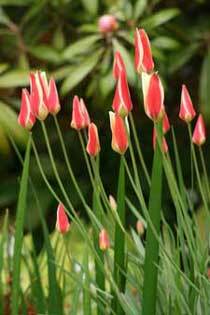 “On cloudy days the buds stay closed and remind me of miniature tulips hanging upside down. Stark white, they are graceful and elegant. “On sunny days, though, the outer whorl stands literally straight out, like the blades of a helicopter. With the extra-long pedicels, the entire bloom looks as if it could just take off and fly. “The exaggerated, heart-shaped flowers led the Menominee Indian tribe of Wisconsin to use this plant as a love charm,” Bourne adds. Another common name for it is “stagger weed, alluding to this plant’s toxic effect on livestock and presumably people” – which is good news for gardeners because it means that it’s deer-and squirrel-proof. Although in his Yorkshire garden Brook says that “wet winters and slugs” make it “difficult to keep in the ground,” in colder gardens here in the US it’s usually easy to grow. 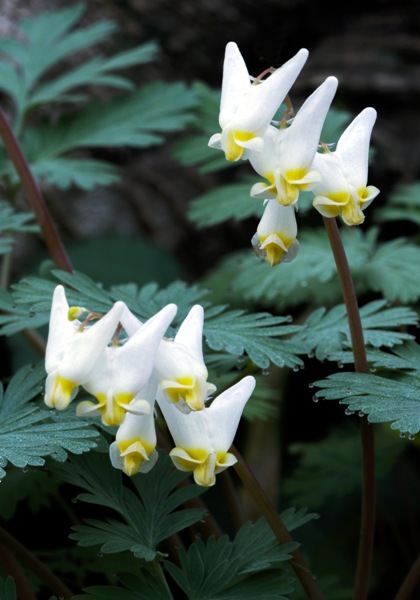 In fact, I once dumped out what I thought was a pot of empty soil in a shady spot in my Ann Arbor garden and every spring since then a little colony of Dutchman’s breeches has been blooming and spreading happily there. and elegant martagon and regal lilies. 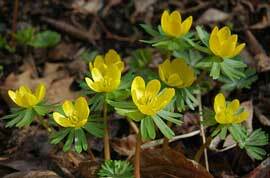 Always the first bulb to bloom here in our garden, winter aconites are thrilling, cheery, and carefree — so why aren’t more people growing them? Spanish bluebells are great. Also known as squill in the South, they’re tough enough to bloom and naturalize just about anywhere. But if it’s English bluebells you’re looking for – the iconic wildflower of British woodlands – you’ll need to know how to tell them apart, because counterfeits are ubiquitous. As head gardener Quentin Stark explains in the May 2015 issue of The English Garden, English bluebells are “a wonderful rich blue. The flowers are tubular and grow on just one side of the stem, and they have an amazing scent. Spanish bluebells are taller, with paler blue, more open flowers, have no scent, and the flowers grow all the way around the stem, making the plant more upright.” To see what he means, check out this excellent close-up photo. Thanks to all of you who responded to our query about growing pink surprise lilies, Lycoris squamigera, outside of the narrow range we’d been recommending for them. You gave us lots of great feedback, and here’s the short version of what we learned. ZONES — Many readers told us they’ve had long-term success with surprise lilies in zones 5b and 8a, and for the past couple of years we’ve been getting our bulbs from a third-generation bulb farm in 8a, so we’ve now expanded our zone recommendations to include zones 5b-8a(8bWC). SOIL — Although well-drained soils are usually recommended for surprise lilies, several readers say theirs grow just fine in clay soil. Clay is dense, though, which makes it harder for bulbs to multiply, and it holds water longer which can cause bulbs to rot. WATER — Many readers say they never water their surprise lilies, and that may be a good thing. Like most bulbs, they do best when they’re relatively dry during their summer dormancy. Since many of us water our gardens then, this could be one reason they’re often found surviving in lawns and “neglected” areas that get less watering — though of course they do need water when they’re not dormant, from fall through the end of spring. SUN/SHADE — Full sun seems to suit them best, especially the further north they’re planted. But many of our readers said they do well in partial shade, too, especially if it’s from deciduous trees which leaf out later. PLANTING DEPTH — Some authorities say to plant them with the neck just under the soil surface, but our expert North Carolina grower recommends planting them so they’re covered with 2-4 inches of soil. Since the bulbs we ship are 3-4 inches tall, that means planting them with the base 5-8 inches deep. LONG WAIT FOR BLOOM — If you dig them from a neighbor’s yard you probably won’t have this problem, but if you plant dry, dormant bulbs you’ll have to be patient. Although most will put up leaves their first spring, sometimes nothing emerges until the spring after that, and they virtually never bloom until their second or even third year. Teach Us, Please: Where (and How) Do Pink Surprise Lilies Grow Best? I was surprised to see a couple of pink surprise lilies (Lycoris squamigera) blooming here in Ann Arbor recently, and they reminded me that we wanted to ask your advice on growing them. Although we recommend them for just zones 6a-7b(8bWC), some authorities recommend them all the way from zone 5a through 9b, so . . .
1. If you garden in zone 6a or colder: Is pink surprise lily winter-hardy for you, and do you have any tips — sunlight, soil, planting depth, watering, winter protection, etc. — for getting it to multiply and bloom happily? 2. If you garden in zone 8a and warmer : Is pink surprise lily thriving for you, and do you have any tips — sunlight, soil, planting depth, watering, winter protection, etc. — for getting it to multiply and bloom happily? “One spring, with a gift of adder’s tongue, Emily enclosed this poem, noting their dappled leaves. Can you keep a secret? When she ordered this past fall, Paula Kocher of zone-6b Malvern, Pennsylvania, asked about putting bulbs in her husband’s Christmas stocking. We told her that, although that might work for tulips, daffodils, hyacinths, and lilies, it would be risky for the small, tunic-less bulbs she wanted to give him. But it HAD to be those bulbs, she replied, so . . . .
How Do Red Spider Lilies Know It’s Fall? “It’s the first great mystery of fall,” our long-time friend Bill Finch of the Mobile Press-Register wrote back in 2009, “and even after watching it happen for nearly 50 years, I can’t get over it: The naked flowers of the lycoris, the red spider lilies, emerging from the weeds of summer. Doesn’t it worry you in the way it worries me? How do they know, with such absolute certainty year after year, that it’s the first of September, and the great wheel of the seasons is slowly but inexorably turning toward fall? The Martha Stewart Show wasn’t the only exciting thing I did in New York last week. I also visited the High Line, a cool new park built on an abandoned railway high over the streets of Manhattan. The railway was originally used to deliver meat, produce, and raw materials to warehouses and factories along the west side of lower Manhattan. Abandoned in the 1980s, it was slated for demolition until neighborhood activists, inspired by the way nature was reclaiming the railbed, convinced the city to recycle it into an aerial greenway. Since opening in 2009, the park has become wildly popular and sparked billions of dollars worth of re-development in the area. True, zone-6 hardy Byzantine glads have gained another fan — His Royal Highness Prince Charles! In the March 2011 English Garden magazine (on newsstands now), Claire Masset reports on the Prince’s innovative, all-organic gardens at Highgrove, his family estate. Are Red Spider Lilies Hardy in Wisconsin??? “Here in my zone-5a Wisconsin garden, I have been growing the heirloom form for two years now, and although they have proved hardy enough to survive the winters with no special care, they may not be truly suited for this climate. “Red spider lilies put up leaves in the fall which have to survive until spring. Last winter we had lows of -20 F, three weeks when the temperature never once rose above freezing, and destructive, desiccating winds. Nevertheless, every one of my bulbs still had green leaves this spring, albeit shorter, as they were burned back by the cold. On the bulbs I planted last fall, most leaves were 4”-6” long, as they were not able to grow much longer before the weather turned inhospitable. Those that were already established, planted the year previous, grew much longer foliage that lay down on the ground after the first snow and survived the winter nearly fully intact. Currently in late June all of the foliage is still green with no signs of dying back, although I suspect it will soon. American-Grown Surprise Lilies: Reserve Yours for Fall Now! More and more gardeners across the country are singing the praises of our true, hardy Byzantine gladiolus. 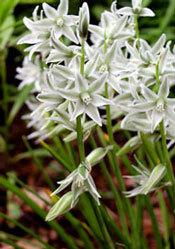 Formosa lily: “This heirloom bulb is back in vogue,” and Jenny praises its rich fragrance. Red spider lily, Lycoris radiata: Its “sea-urchin-like flowers” are showcased in a full-page photo. (Please note that we recommend it for zones 7-10 only). Are Wild English Bluebells Doomed?